How many times have you looked at yourself and felt the sudden urge to work out? So you hit the treadmill or the elliptical and for 20–30 minutes you give it all you have. When you’re finished, you feel momentarily great but then you come out of it feeling sore, tired and over it. And then, more likely than not, you never go back to the same workout again, because rather than feeling fulfilled by your accomplishment, you associate the exercise with the pain it produces. What if you started to associate exercise with pleasure instead? What if someone told you that you could lose weight by exercising comfortably? Doesn’t sound real, does it? Well, you can: it’s called aerobic exercise. Before exploring what aerobic exercise is all about, let’s start with the problem: Many people work out because they want to lose or maintain weight. If you want to lose weight, you probably mean that you want to lose fat. The first thing a lot of people will do is cut as much fat as possible out of their diet. This is the wrong approach, though, because as soon as you drastically cut your fat intake in your diet, your brain will think you’re starving yourself, and it will begin to save and store fat in your body for future usage. When most people go on a diet they look to cut out fats, and that’s why most diets fail. It’s why 95–97% of people who diet will regain any weight they lose over the following two to three years. That’s right! People who diet more often gain, not lose, weight over the long-run. What’s tragic about people who try to diet and fail is that they often end up blaming themselves, and they’re less likely to try again in the future. But the truth is that it wasn’t them who failed – it was their strategy. A crazy diet is not going to drive you toward the outcome you’re working so hard to achieve: sustainable weight loss and healthy living will though. Now, none of this means that eating healthy doesn’t matter. Eating right is crucial to keeping your cells in peak state and generating the energy that keeps you motivated, and it can help you fight inflammation and joint pain. Consuming the right nutrients, and keeping your body clean of toxins, is key to living healthy, but let’s focus on weight loss here. Dieting is not your solution to fat loss, aerobic exercise is. Aerobic exercise for weight loss is enjoyable, and there are several ways to learn how to enjoy working out. We all have that friend who always talks about losing weight, and maybe that person built up their confidence and motivation to go the gym or get on the treadmill at home. Then, a week later, they don’t talk about exercise at all and they have no results to show for all the hard work they put in after they first got the urge to do something about their weight. What happened was your friend decided to work out intensely, associating that intense pace with weight loss. But it’s painful and difficult to maintain that pace, and no one wants to do painful things, which is why your friend never went back to the gym. If you associate exercise with pain, you’ll never develop a successful and sustainable workout habit. Learning how to enjoy exercise all comes down to changing your mindset. How are you thinking about exercise? Are you thinking it has to be painful to be worth it? Identify limiting beliefs that don’t serve you and adopt a healthier attitude about what exercise feels and looks like for you. What happens when you’re exercising anaerobically? 1. You’ll start to store fat since the body will move toward using glycogen to supply the necessary energy. Do it long enough and you’ll rewire your brain to automatically burn glycogen over fat. 2. When your storage of glycogen is consumed your body will turn to your blood sugar. Two-thirds of your blood sugar is used by your nervous system to operate, and there are a host of health problems that come with low blood sugar. 3. Your muscles will undergo a large oxygen deficit and, as your body reroutes more oxygen toward your muscles, your organs will begin to suffer. When organs, and the cells they’re made of, weaken, some mutate and some die. Overall, your body will start to experience micro-breakdowns and, over time, this can become quite serious to your health. Not exercising doesn’t work either, so the right program lies somewhere between exercising too lightly, or not taxing your lungs and your heart enough, and anaerobic exercise, or overtaxing your body. The balance you’re looking for comes in the form of aerobic exercise. How do you know what this balance is in practice? The easiest way is to measure your heart rate and to keep that rate between a certain range while you exercise. That range, where your heart rate should be while you work out, is between 65–85% of your maximum heart rate. Let’s break this down. What’s your maximum heart rate? A good rule of thumb is 220 beats per minute (bmp) minus your age. If you’re 40, for example, your maximum heart rate is 180. Sixty-five and 85% of that are 117 and 153, respectively. So, in other words, if you’re jogging, walking or doing whatever exercise you prefer, your heart rate should be between 117 and 153. How do you measure your heart rate, though? It’s not as if you’re going to keep your finger on your pulse while you run, right? Before you fill your closet with new workout clothes, buy a heart rate monitor — it’s a little device that goes on your chest and is connected to a watch on your wrist. And with most of these devices, you can program it to warn you when you’re leaving that range of aerobic exercise. The best thing about aerobic exercise is that it’s surprisingly easy. In fact, you might find yourself wanting to push up the intensity, but don’t. The whole point is to commit to a longer, but easier, workout that helps train your biology for weight loss, rather than a short, intense workout that won’t burn fat and has a high probability of ending in injury. Aerobic exercise is key to a long-term, sustainable fat-burning program — one that focuses both on your weight and on your overall health. Not to mention that aerobic exercise is key to figuring out how to enjoy exercise. If you’re performing aerobic exercise, the key is to work your body just the right amount. You want to work up a sweat without putting too much stress on your body. There’s no specific exercise that you need to religiously perform to accomplish this. 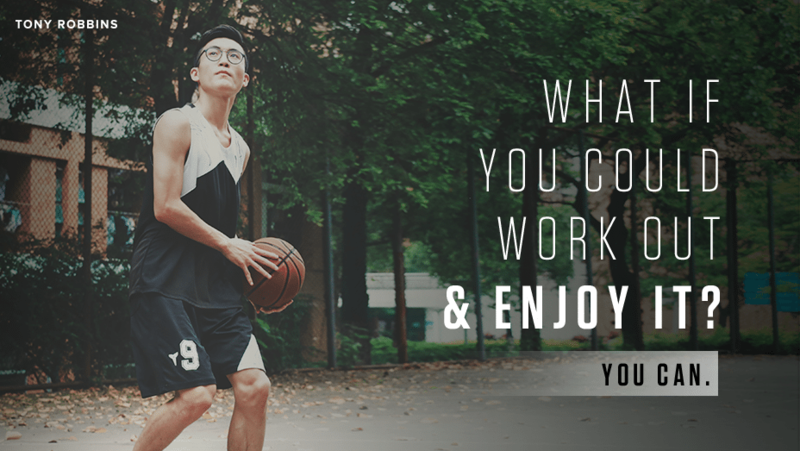 Do what you like and find the most enjoyable. If you like playing tennis, then play tennis. If you love jogging, then jog. The point is to find something that speaks to what you like so when you go out and exercise, you enjoy it. This will help you discover how to enjoy working out and will make it easier to sustain the habit. If exercise is so painful that it’s not enjoyable to you, or if it’s so intense that it makes you uncomfortable, then you’re not going to be interested in turning your new interest into a long-term habit. What happens is that your brain starts to associate pain with exercise and instead of working out, you’ll avoid it. In economics, they use the term “disutility” to describe activities that we don’t like, but do anyway for some indirect purpose. Work is a clear example of disutility. Nobody liked working in an early 19th century factory, but they did it anyway to put bread on the table and provide for their families. But, even with work that you don’t enjoy, this practice is not sustainable — you either quit or a conflict between employee and employer destabilizes the workplace — which is why people tend to work doing something they like. Exercise should be similar in that you should work out in the ways that speak to you, otherwise you’re not going to enjoy it and you’re not going to do it. What kind of physical activity are you going to enjoy for 40 or 60 minutes each and every day? Is it dancing? Tennis? Whatever it is, then do that as your exercise. There’s no right or wrong way to get in shape. 1. Keep your heart rate within 65 and 85% of your maximum heart rate. Remember, the latter is roughly 220 minus your age. 2. Make sure to warm-up to the highest intensity allowed by your heart rate. Don’t start at that 65% right away. Spend 12 minutes of your 60-minute workout, or whatever it is, stretching and preparing your body for when you go into aerobic capacity. Similarly, warm down too at the end of your workout. Don’t surprise your body by immediately going full speed ahead without warning. 3. Frequency matters. You should be working out four or five days a week, on average. If you’re out of shape you might adjust that downwards to three days and work your way up from there, but clearly one day a week isn’t going to do the trick. Start at a level you’re comfortable at, but keep in mind that the ultimate outcome is to build a pattern of aerobic exercise that shifts your body toward burning fat, rather than glycogen. What if I don’t have enough time to work out? Does losing weight matter to you? The better question is: Is weight loss a highly valued outcome to you? Is your health a priority? If achieving that healthy body that you want is an outcome that you really want, then the “I don’t have enough time” excuse is just that, an excuse. Oftentimes, we use “I don’t have enough time” when in reality the problem is that we don’t enjoy the exercise. We’re worried about our resources instead of being resourceful. If that’s the case, opting for aerobic activities through exercises that you like won’t only solve the problem, but you’ll find that if you turn a “should” into a “must” and get into the rhythm of frequent aerobic exercising, you’ll end up loving it. And after the first week, it’s going to be something you will begin to look forward to as it becomes part of your life and culture. What if, liking exercise aside, you think that you just don’t have the time to exercise? Maybe 9 or 10 p.m. isn’t an option because it’s important to you to watch the nightly news. Don’t make excuses – instead, find a solution. Rig up your elliptical in front of a TV and work out then! Or maybe you take 15-minute breaks at work that you spend sitting in a break room or at your desk. Likewise, maybe you spend your 30-minute lunch at your desk. You could instead use that time to walk around your office, or wherever you work from, and that’s an easy 30–60 minute window of time that you’re getting in some exercise. Tony refers to the concept of N.E.T., or No Extra Time time, in situations such as these. Combining exercise with other pleasurable activities that you like to do is a great way of motivating yourself to putting in the time for aerobic activities. Some people love to read. They love reading so much that they’ll make a slot to get at least an hour’s worth of pages read every day. Does that take an hour away from exercise? No! You can read while you cycle or jog on a machine, and in fact that’s what a lot of people do. And in an hour’s worth of time you’re meeting two separate outcomes, rather than just one. Your workout doesn’t need to be 30 or 60 minutes long if you absolutely do not have that kind of time. But ten minutes here and ten minutes there throughout the day does make a difference, the difference being that between a little bit of exercise and no exercise at all. So if you ever find yourself doing something while sitting, something that you could just as easily do while moving, then get up and move around. Some of the healthiest, fittest people aren’t necessarily the same people who go to the gym for hours. They’re the people who move around while still accomplishing daily tasks, opting to walk instead of drive to work, keeping their heart rate within the optimal range and training their metabolism to burn fat. If you’re serious about weight loss and healthy living, and if you’re serious about finding out how to enjoy working out, you can learn more about fat burning, maintaining a healthy body and aerobic exercise in Tony Robbins’ The Body You Deserve.